50th Anniversary Celebration of THE FLYING BURRTIO BROTHERS' "GILDED PALACE OF SIN" / MARIAN RUNK Saturday, April 27; 9 pm to midnight; 21+ / $5 JOHN KIMSEY and DECOY PRAYER MEETING with DONNA ADLER perform The Flying Burrito Brothers' "Gilded Palace of Sin" to celebrate the 50th Anniversary of the classic album's release in 1969 - along with further choice songs of Gram Parsons, Emmylou Harris and related artists. This year marks the 50th anniversary of The Gilded Palace of Sin, the debut album by The Flying Burrito Brothers, a band founded by ex-Byrds Chris Hillman and the now-legendary Gram Parsons. 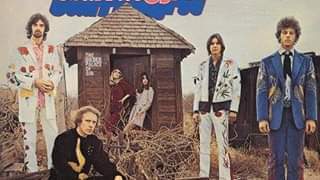 Both the album and band were game-changers, igniting what became known as country rock -- and, eventually, Americana -- eons before others tried to appropriate their witty, soulful style (which was often imitated but never duplicated). Drawing on rock, country and Memphis soul, Gram just called it Cosmic American Music. We will celebrate this occasion by doing the Burritos album in its entirety, along with numerous selections by the Byrds, Gram solo, Gram & Emmylou Harris in duet, Emmylou solo and – wait for it -- the Rolling Stones, on whom Gram had a big influence during their peak years, ’69-‘72. A la Chris and Gram, John Kimsey (of the Twisted Roots Quartet and psychedelic rockers Medicated Goo) will partner up with Montrose Saloon music master Eric Chial, backed by his band of honky tonk heroes, Decoy Prayer Meeting. Donna Adler will co-star on Emmylou's parts. Opening set by Marian Runk. Y'all come! Decoy Prayer Meeting’s album of originals, “west of California, south of North” is here: https://soundcloud.com/eric-chial/sets/west-of-california-south-of-north. Their album of classic country recorded live at WBEZ is here: “https://soundcloud.com/eric-chial/sets/decoy-prayer-meeting-live-in. John Kimsey & the Twisted Roots Quartet’s latest album of originals and three reimagined covers, Live at the Liberry, is here: https://johnkimseythetwistedrootsquartet.hearnow.com/ Watch them perform Kimsey’s “Elvis on Velvet” here: https://vimeo.com/320809264 ---------------------------------------------------------------- MARIAN RUNK https://www.facebook.com/MarianRunkMusic https://marianrunk.com Marian Runk was born in Dallas, TX, to a symphony musician and a science teacher. During childhood road trips to the Texas hill country, she learned the Dolly Parton, Emmylou Harris, Linda Ronstadt “Trio” album word for word. Those country harmonies lay dormant until the late aughts, when she started singing and playing guitar & banjo in Chicago. Today, Marian writes songs about love, loss, death, restlessness, and the natural world. Her debut album, A Few Feet from the Ground, hovers in and around the genres of country, folk, and blues. It offers both lush full band and spare solo arrangements that highlight a clear voice and emotional arc.